The bat bug (right) has longer fringe hairs on its pronotum than the bed bug (left). Other Cimicids that feed on bats and birds can be mistaken for bed bugs. 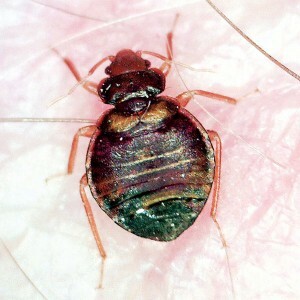 Bed bug lookalikes will bite people, but are not known to survive on humans alone. With all the bed bug (Cimex lectularius) activity these days, it’s common for someone to bring you a bug desperately hoping it’s not a bed bug. Just because it looks like a bed bug, though, doesn’t mean a closer look is unnecessary. Although bed bugs are far more common now than their lookalikes, it’s important to recognize the imposters when they do show up. The most common are bat bugs, but there are also swallow bugs, chimney swift bugs and a handful of others. There are at least 16 species of Cimicids reported in North America. Some can be difficult to tell apart even with a microscope, but those most commonly seen can be distinguished with a little effort. Bat bugs (Cimex adjunctus) are the same size as bed bugs, but with a little magnification the differences are pretty clear. The fringe hairs of the pronotum of the bat bug are significantly longer than those of the bed bug. The key character is that the hairs of bed bugs are shorter than the width of the eye itself, whereas those on the bat bug are as long as or longer than the eye. Quite simply, they look like shaggy bed bugs. Swallow bugs (Oeciacus vicarius) feed on cliff and barn swallows. They differ in appearance from bed bugs in that they are smaller and clothed all over in long, fine hairs. 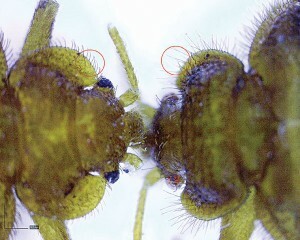 With magnification, the last two segments of the antenna are equal in length in swallow bugs. Chimney swift bugs (Cimexopsis nyctalis) feed on chimney swifts (go figure) and, like swallow bugs, are smaller than bed bugs. Also, their last two antennal segments are equal in length. Unlike swallow bugs, however, the chimney swift bugs are not as hairy in appearance. Nowadays, bed bugs are more common than their lookalikes. The first indications that you’re dealing with something similar to, but not a true bed bug infestation, may be clues unrelated to appearance. All three of the aforementioned species bite people, but usually come out of walls to do so. They are normally found near exterior walls or near chimneys, and especially on upper floors. When the bites are sporadic and the bugs aren’t living on or around beds, you might check those bugs more closely. The reactions to the bite of these lookalikes may be the same as bed bugs, but the treatment will be totally different. Treating the bat roosts or bird nesting areas for these bugs is critical, but once you locate them, the whole operation becomes pretty simple. Keys to the identification of common Cimicids can be found in a number of industry reference books, including Truman’s Guide to Pest Management Operations. You will need a strong hand lens or simple microscope, but the differences can easily be seen with a little practice. When you suspect a bat bug, swallow bug or chimney swift bug, have the identification confirmed by an entomologist trained in urban pests. Once you have a confirmed case, be sure to collect a number of specimens and keep them as a reference collection for the future. It is much easier to identify these insects if you have known specimens preserved and labeled for comparison. You can reach Contributor Mark Sheperdigian, BCE, at shep@rosepest.com. 1 Comment on "Clues to identifying bed bug lookalikes"
Some important things to keep in mind when looking for potential bed bugs. There are a lot of bugs out there that look similar! Thanks for sharing this.